The religious right’s embrace of Trump is now complete. They will choose the serial philanderer and chronic liar over one of their own. By any measure, Jeff Sessions should be the religious right’s dream Attorney General. 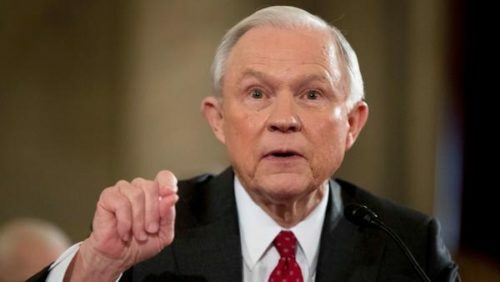 Long a darling of conservative evangelicals, Sessions had an impeccably anti-LGBTQ track record as a Senator. As Attorney General, Sessions has continued his crusade. He has rolled back gains made under the Obama administration, spoken before hate groups, and established a task force to promote religious liberty whose real goal is to enshrine anti-LGBTQ discriminiation. But Sessions is discovering that, among his fellow conservative Christians, even all of that isn’t enough. Because Sessions recused himself from the investigation into the Trump campaign’s collusion with Russia, they are deciding that he has to go. Jerry Falwell Jr., one of President Trump’s most vocal evangelical supporters, is now saying that Trump should fire Sessions. Moreover, taking a page from the Donald, Falwell rewrites history and personally demeans Sessions in doing so. In essence, Falwell is accusing Sessions of simply using Trump to further his personal ambitions. In fact, Sessions was the first Senator to endorse Trump, at a time when the candidate looked like a sure loser. Trump’s hardline anti-immigration rhetoric echoed Sessions’ own beliefs. In fact, Stephen Miller, the creepy presidential aide pushing Trump’s immigration policies, came from Sessions’ office. Gary Bauer, another long-time religious right leader, agrees, saying that “there’s growing disillusionment in the conservative faith-based community” over Sessions. Sesssions’ sin is that he’s acting like the Attorney General and not the mob lawyer that Trump longs for. Falwell and other Trump boosters want Robert Mueller to be fired, and Sessions stands in the way. They also want an Attorney General who will abuse the power of his office to conduct the kind of partisan investigations that Trump wants. The fact that Sessions has delivered with distressing efficiency on many of the religious right’s goals, particularly related to LGBTQ issues, means nothing to leaders like Falwell and Bauer. In their thinking, the only real leader is Trump himself. Anyone who doesn’t carry out his every whim should be thrown under the bus. Which is exactly what Trump is telling them. Just this week, Trump and Vice President Mike Pence hosted a “state-like” dinner at the White House for religious right leaders. A recording of Trump’s comments at the event showed him appealing to the gathering for political support in the coming election. In embracing Trump, conservative evangelical leaders have chosen the cult of personality over their own principles. It’s not as if this is a surprise. After all, they’ve not only turned a blind eye to Trump’s faults but found novel explanation to excuse them. But in turning so viciously on Sessions, Falwell and his peers have signalled that only Trump matters. Sessions is expendable. After all, his successor will be just as anti-LGBTQ. But without Trump, it will all collapse. What makes this stance so odd is that Mike Pence is waiting in the wings. Unlike Trump, Pence is the real deal and, if anything, would be even more committed to the religious right’s causes than Trump. Yet, as the willingness to throw Sessions under the bus proves, it’s never been about principles or even policies. It’s about power. All of it resides with Trump. For now.